We are one of the leading names in the field of providing equipment rental and contract management services to various industries. 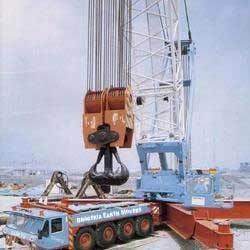 For providing crane services we have mobile cranes, hydraulic cranes, crawler cranes, telescopic cranes and also used cranes imported from foreign countries including USA, Europe, Japan and Taiwan. We make sure that our efficient service is fit under the budgetary control of the customer. Our crane hiring services comprises of mobile cranes, hydraulic cranes, crawler cranes, telescopic cranes, used cranes, man lifts, crane services, crane rental service, building crane rental service, cargo handling services, cranes for projects and structural erections services. Our High Tech Cranes are precision engineered using the advanced technology and serve diverse demands of our clients. These are basically used in the construction industry for different purposes. Our such machines are generally applicable for Bridge girders, moreover, they have a box shaped construction including tapered plates. Ensuring their long service life, we provide them in different sizes.